An unfortunate encounter with a cherry pit did in Hans-Peter Weber’s molar. Even a dental school professor emeritus is not immune from the kind of accident that can claim a tooth. Today, some 178 million American adults are missing at least one tooth, the result of trauma, decay, or gum disease, and roughly 40 million have lost all of them in one or both jaws. The club of people missing teeth is enormous, and it’s one that many more people will inevitably join as they age. After a sleepless night, a trip to the oral surgeon, and a subsequent extraction of the molar, Weber now finds himself waiting for a bone graft to heal, so that his dentist can place an implant. Even just a generation ago, he might have gone with a different prosthetic. But now, an implant is the only solution he considered. And with about half a million dental implants placed in the US last year, Weber is hardly alone in making the choice (although he’s likely to be the only person in the waiting room to have coauthored a textbook on the subject). Following decades of research that has led to highly successful outcomes, implants are increasingly the preference for patients. Between 1999 and 2016, the number of patients with missing teeth who opted for implants increased 14 percent a year, on average, according to a recent study drawing on data from the National Health and Examination Survey (NHANES). To best serve their patients, more dentists and dental students are understandably eager to acquire and perfect their implantology skills. 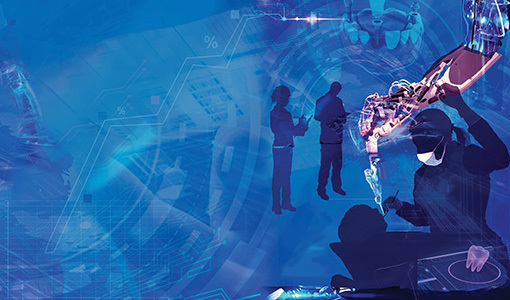 New technology, such as advanced imaging and robotic-assisted equipment, is enabling them to plan and place implants and restorations with ever increasing ease and precision. Meanwhile, Tufts School of Dental Medicine is responding with its own innovative research, paired with changes in curriculum and new facilities for patient care. “Implant dentistry gives us different ways to think about cases, and to treat cases: A whole different tool box to help our patients,” said Nadeem Karimbux, associate dean for academic affairs. Judging by the archaeological record, humans have been experimenting with ways to replace their missing teeth for millennia. Evidence of attempts to use stones or pieces of shell have been found in ancient Mayan and Egyptian remains. By the time of George Washington, the materials for false teeth had evolved to ivory and animal bone; later, so-called “Waterloo teeth” gathered from the corpses of fallen soldiers came into use. Comfortable, affordable dentures—fitted with porcelain teeth—finally went mainstream in the mid-19th century, following Charles Goodyear’s breakthroughs with vulcanized rubber. Dentures reigned in dental medicine for more than a century. Although the first modern implants, with metal or ceramic posts or threaded screws that fuse with the jawbone and support a crown, date to the post-WWII period, it wasn’t until the early 1980s that titanium implants as we know them emerged. That’s when an effective system developed by Swedish researcher Per-Ingvar Branemark began to be taught widely, and when the FDA approved the use of titanium dental implants in the U.S. In the years since, the use of implants has only grown. A study in the Journal of Dental Research published in August reported that in the period 1999-2000, 0.7 percent of people missing a tooth had an implant. By 2015-2016, the figure had increased more than eight times, to 5.7 percent—and the researchers estimated implant use could reach as high as 23 percent by 2026. The most substantial increases in adoption have taken place over the last decade, in concert with declines in healing time and implant failures, and the aging of the Baby Boomer generation. Seniors are not the only candidates for implants, however. Prosthodontics Chair Wael Att, who previously taught in Germany, said the large proportion of cyclists in Europe led to many younger patients who’d left a tooth on the roadside. But aging takes its toll on dentition, and NHANES data showed people ages sixty-five to seventy-five getting implants at a much faster clip than younger adults. Market research firms predict the global implant market will grow at a rate of about 7 percent a year, reaching as much as $6.5 billion by 2024. Compared to other forms of restoration, implants can offer patients a more natural look and ease of use because they remain permanently affixed. From an oral-health perspective, they can help maintain bone, and don’t require work on the existing teeth alongside them. Yet implants are not right for everyone. Sufficient bone is still needed to hold the implant in place, and bone augmentation is not always possible. Peri-implantitis—inflammation and infection of the gum and bone surrounding the implant—is a risk. Smokers, people with diabetes, and others with slow healing face the most challenges. And contrary to what many patients believe, implants are not maintenance-free, and consistent follow-up is needed. Ultimately, 5 percent to 10 percent of implants fail. 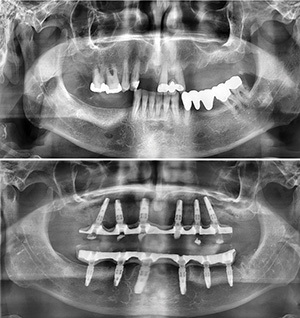 For straightforward cases, however, general dentists have been increasingly offering surgical placement of implants. More than half the roughly 500,000 implants placed in the U.S. in 2017 were done by general dentists, according to the American Academy of Implant Dentistry, with training coming primarily from continuing education courses and implant manufacturers. And dental educators well understand that implantology skills will be in demand for new dentists, which is why Tufts is deepening its investment in resources and teaching. If anything is slowing the rise of implants, it’s cost. Because every case is different, numbers are hard to come by, but estimates suggest the price of implants can range from about $1,000 to $3,000 for a single replacement, and reach into tens of thousands of dollars for a full mouth. At the same time, public insurance programs do not cover implants, and many private insurance plans cover only a portion of the cost for the restorations, and don’t pay anything for the surgical placement. According to demographic research in the JDR study, implant recipients are more likely to be white, have more than a high school education, and have private dental insurance.